We’re proud to supply pure, organic tea for several craft kombucha makers. If you're looking to source tea for your kombucha-making venture, we’d love to help. 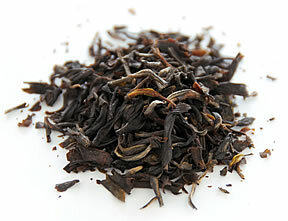 We can supply bulk loose tea or tea bags to beverage companies or small-batch home brewers. For home brewers shop our selection of bulk teas, for large scale brewers contact us through the form at the bottom. I'm interested in buying wholesale! Kombucha is a fermented tea made from five simple ingredients: water, tea, sugar or honey, bacteria, and yeast. Born from a symbiotic colony of bacteria and yeast (a.k.a. SCOBY), kombucha is made by adding the colony to tea brewed with sugar, honey works as a natural alternative, and allowing the mix to ferment. The SCOBY eats most of the sugar in the tea, transforming it into a fizzy, sweet-sour, fermented (but mostly non-alcoholic) beverage that is low in calories and sugar and touts lots of health benefits. Many of the kombucha’s health claims are around a healthy gut—it’s full of probiotics (a result of the fermentation process) that make our intestines happy and can help boost our overall health. The most important ingredient? Tea—but not just any tea. Use pure black, green, white, or oolong tea for brewing kombucha. 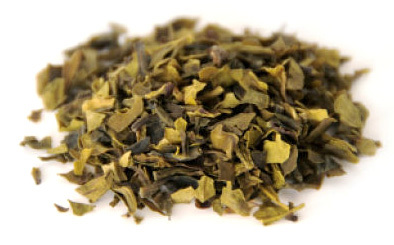 You’ll get the cleanest flavor and the most impact from the nutrients from the leaves of the Camellia sinensis plant. 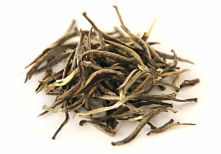 You can even blend different tea leaves together to create different flavor profiles. Avoid using scented or flavored teas; the chemical compounds used in the flavoring process could have a negative effect on the growth of your kombucha culture. Don’t try to use herbs like peppermint or chamomile as your brewed tea base. Herbs won’t be able to provide the nutrients necessary to feed your kombucha culture. Herbs may also introduce naturals oils, which can interfere with the SCOBY’s ability to absorb oxygen, or antibacterial properties, which can harm the bacteria component of the SCOBY. Did you know that the very first time tea leaves are washed is when they get brewed in hot water? If your tea leaves are coated in pesticides those chemicals will show up in your brew and you’ll ingest them. The same chemicals can inhibit the kombucha fermentation and brewing process and can eventually kill your SCOBY. Every kombucha needs a SCOBY, or starter culture, sometimes also called a “mother” or “mushroom”. You can source SCOBYs from folks you know are already making kombucha, or you can order a SCOBY online. 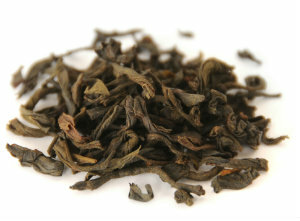 Brew black, green, white, or oolong tea (or a combo) and sweeten it with granulated sugar. The sugar and tea will provide the fuel needed to feed the fermentation process. Once the sweetened tea is brewed and completely cooled, add your SCOBY. Then top it off with a bit of already brewed kombucha, either from a previous fermentation or from a store-bought bottle. The acid in the starter kombucha helps create an environment that will jumpstart the fermentation process. Here’s where the magic happens. Let the mixture sit at room temperature for about a week to start the fermentation process. The yeast in the SCOBY converts the sugar to alcohol and bacteria converts the alcohol into vinegar. Once it tastes like a nice balance of sweet and sour, move on to bottling. Strain the fermented tea into airtight bottles. You can either refrigerate and enjoy the tea now, or leave the bottled tea at room temperature for a few more days to continue the fermention process. This will add even more sweet-sour flavor to the brew. You can boost the flavor and fizziness of your kombucha by adding dried fruits (like cranberries, apricots, blueberries, or cherries) to the bottled brew. The sugars in dried fruit will act as a source of food for the remaining yeast in the kombucha to eat and carbonate your beverage. Be sure and seal the kombucha in an airtight container if you want the fizz. 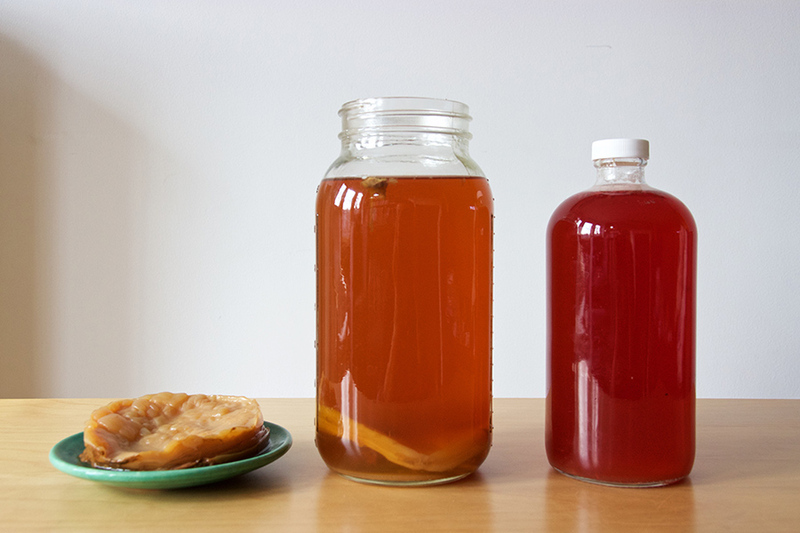 Transfer your SCOBY to a fresh-brewed batch of sweetened tea to start more kombucha, or store it in the refrigerator in a sealed jar with kombucha starter. The SCOBY will go dormant in the refrigerator until you are ready to bring it out and feed it with your next batch of kombucha. The fermentation process converts yeast to sugar and sugar to alcohol. But the alcohol then gets converted into vinegar while it ferments. So, yes, there’s a little alcohol in a brewed batch of kombucha, but usually no more than about one percent—so it won’t make you tipsy, even if you drink a lot of it. Which is why kombucha has become such a popular and healthy drink to have on tap at bars and breweries…so the designated driver can enjoy a tasty beverage with friends without the boozy side effects.